The Kick-off meeting of the Erasmus+ Project ‘’Promoting internationalization of research through establishment and operationalization of Cycle 3 Quality Assurance System in line with the European Integration” started at 10:00 am. The kick-off meeting was organized according to the initially announced Agenda (see attached in Annex 2). 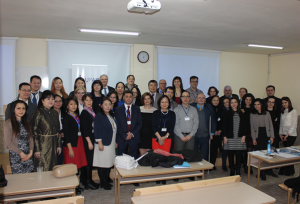 The welcome notes were followed by short presentations by the 21 participants of the Project introducing their institution, their involvement in the Project and the staff members from their institutions who visited Armenia. Presentation 1 – The objectives, activities, deliverables and life cycle with special focus on activities for the 1st year of the C3QA Project were presented by Dr. Susanna Karakhanyan, Project expert, President of International Network for Quality Assurance Agencies in Higher Education (INQAAHE). The presentation was followed with a session of Q&A for each representative from a partner country to ask questions, voice opinions, get clarifications (see attached the presentation materials in Annex 3). Presentation 2 – The organization of Project’s WP1 was elaborated in a joint presentation by Dr. François Pernot, Director of Department “Europe and International” of Haut Conseil de l’évaluation de la recherche et de l’enseignement supérieur (HCERES) and Mrs. Solange Pisarz, Head of Project for Europe and International Department. The detailed plan of WP1 was presented setting up the required deadlines for each of the activities envisioned for the 1st year of the Project implementation. The presenters shared handouts among the participants containing additional data and relevant information on the WP1 deliverables (see attached the presentation materials in Annex 4). Presentation 3 – The Project’s methodology: strategic and daily management of the project were presented by Dr. Arayik Navoyan, Project Coordinator, Vice-Rector of UFAR (see attached the presentation materials in Annex 5). For the 1st meeting of the Governing Board a request was made to nominate one member per institution and one contact person by the 13th of February, 2017. It was also requested to establish and announce the names of a working group (up to 5 peoples) from each institution by the 13th of February, 2017. It was agreed that the Partnership Agreements should be signed between the grantholder and partner institutions covering the roles and responsibilities and budget for each partner institution. The partners’ feedback on draft Partnership Agreement was set to be submitted by the 13th of February, 2017. Furthermore, the launch of the Project’s official web-site was announced operating under the following web-address: http://c3-qa.com/. 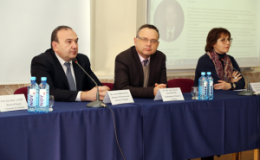 The venue of the upcoming capacity building training was announced to be hosted by Kyiv National University of Trade and Economics, KNUTE in Ukraine. The presentation was followed by a session of Q&A. Question – Mrs. Amarjargalan Tumurbaatar, Director of Higher Education Department, Ministry of Education, Culture, Science & Sport in Mongolia asked about the common format of reporting. Answer – Mrs. Solange Pisarz, HCERES representative, answered that their department would send a template of reports to all the partner institution in order to have a common format of reporting throughout the WP1. 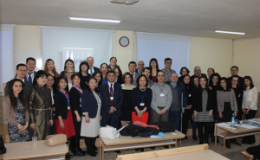 Suggestion – Mrs. Bakhytkul Abdizhapparova, Accreditation Department Head from Kazakhstan came up with a suggestion that each partner institution could place a link to the main C3QA website so that the Project materials and deliverables would be accessible to larger audiences. Suggestion – Mrs. Edith Soghomonyan, Programme Officer from National Erasmus + Office in Armenia added that in order to have more visibility for the Project each partner University could assign a subsection on its International department website page that would include the Project description, its logo and hotlink to the main C3QA website. Question – Mrs. Narantuya Chuluunbat, Vice President for Economics and Development Policy from National University of Mongolia, NUM asked for clarification for the role and responsibilities of a partner representative from each country to be involved in the fact-finding. Answer – Mrs. Solange Pisarz, HCERES representative, answered that 4 reports should be submitted from each country (AM,UKR,KZ,MON) written according to the common template elaborating on the project’s objectives from each country’s context and presenting the methods (surveys, interviews, etc.) for carrying out the in-depth analysis in each of the country. Suggestion – Mrs. Anzhelika Gerasymenko, Executive Coordinator Of The 3CQA Project, Prof., Dr. of the Department of Economics And Competition Policy from Kyiv National University of Trade and Economics, KNUTE informed that given the fact the next board meeting will be held at their institution all the necessary documents, invitations needed for visa regulations will be provided on a timely manner. After a coffee break the participants continued the meeting. Presentation 4 – The Project’s Financial Management was presented by Dr. Arayik Navoyan, Project Coordinator, Vice-Rector of UFAR. The presentation elaborated on the specifics of the Project’s staff costs, travel costs and costs of stay, equipment and subcontracting costs (see attached the presentation materials in Annex 6). Question – Mrs. Iryna Zolotaryova, Head of French-Ukrainian Master Program, Professor of Information Systems Department asked about the necessity of having international tenders for equipment suppliers or having suppliers from each of the partner’s home-country. Answer – Mr. Arayik Navoyan answered that implementation of tenders is obligatory for each of the partner institution. Question – Mr. Miras Daulenov, Pro-Rector for Academic Affairs and Research from Kazakh Humanities and Law University” (KAZGUU) asked about the VAT exemption regulations when buying equipment. 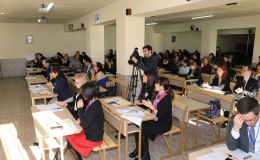 Answer – Mrs. Ani Torosyan, Programme Officer from National Erasmus + Office in Armenia answered that the equipment acquisition is done free of taxes. Presentation 5 – The guidance notes for maintaining the audit track of the Project’s Intermediate and Final Fact Funding audit were presented by Mr. Hrachya Hovhannisyan, Head of Audit and Audit Related Services from BDO Armenia CJSC (see attached the presentation materials in Annex 7). The decisions were unanimously validated by the meeting participants through a common voting. 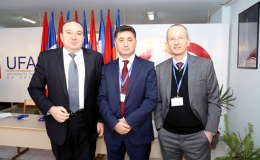 Adjournment – The meeting adjourned by Arayik Navoyan’s remarks who thanked all the participants for their presence and active contribution on behalf of Prof. Jean-Marc Lavest, Rector of French University in Armenia (UFAR). The culmination of the meeting was the group photo taken in the guest hall of UFAR.